Lighthouse Trails exposes the ways in which senior pastor of Calvary Chapel Costa Mesa Brian Brodersen and leading CC pastor and evangelist Greg Laurie are plotting to remove the barriers between evangelical Christianity and apostate Roman Catholicism. According to LT, the plan is to help believers see “the big picture of Christianity.” This is nothing new. The big picture they espouse is just another expression for “big tent Christianity” which stems from liberal/progressive theology, i.e. the Emergent Church. 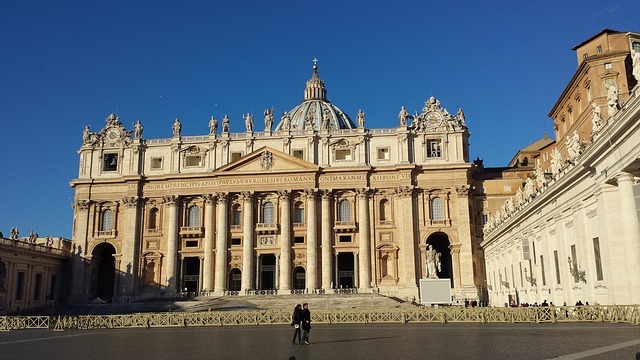 Brodersen and Laurie are not alone in their endeavor to move evangelicals toward Rome. Other highly esteemed leaders such as recently deceased Tony Palmer (who claimed he was “consecrated” by Pope Francis to be a bridge of unity between Protestants and Catholics), Rick Warren, Beth Moore, James & Betty Robison and Kenneth & Gloria Copeland are also on board with the bridge of unity. In fact, all but Beth Moore have had an audience with the Vicar of Rome. Now learn more about the “big picture of Christianity” from Lighthouse Trails…. As we observe evangelical Christianity being drawn toward “the Mother Church” of Roman Catholicism, it is amazing to see how very few Christian leaders speak up about this. On the contrary, one after the next, Christian leaders are succumbing to this ecumenical, interfaith last-days apostasy of merging evangelicalism into the Catholic fold. Lighthouse Trails has reported on numerous examples of highly influential evangelical leaders heading in this direction: Rick Warren, Beth Moore, James Robison, and Ken Copeland to name a few. Sweet was actually quoting Pierre Teilhard de Chardin when he said this as Warren B. Smith points out in his book, A “Wonderful” Deception. What is this “more magnificent way” to which Sweet refers? We know what Chardin means by this, and based on our research on Leonard Sweet and the emerging church, Sweet concurs with Chardin. The “more magnificent way” of seeing things is the paradigm shift that brings all religions together as one, removing all “barriers,” and ultimately leading man to believe he is Divine. Some may say this is a stretch to suggest that Brian Brodersen is thinking this way just because he says “the bigger picture of Christianity.” But is it really a stretch? As we reported earlier this year, Brodersen recently came out publicly promoting the Alpha Course leader, Nicky Gumbel, who is practically in the arms of the papacy and will take millions of Alpha Course participants with him. It was no small thing that a leading Calvary Chapel pastor endorsed Gumbel and the Alpha Course (if you aren’t sure what to think about the Alpha Course, read our recent article by Mary Danielsen and Chris Lawson). While Brodersen is not proclaiming that man is Divine, whether he realizes it or not, he is helping to remove the barriers between evangelical Christianity and Roman Catholicism. What is this “bigger picture of Christianity” that Brodersen is talking about? Is he just talking about the Christianity that is beyond the Calvary Chapel borders? Of course not; that would be nothing new as many Calvary Chapel pastors, including CC’s founder Chuck Smith have acknowledged that the body of Christ includes believers outside of Calvary Chapel. Calvary Chapel has never claimed that the body of Christ was solely within their own walls. Time will tell what exactly Brodersen means by this “bigger picture of Christianity.” However, from our perspective, it stands to reason that Brodersen’s remarks would resonate with Rick Warren’s when Warren has stated on numerous occasions that Christianity does include the Catholic Church and that we should focus more on what we have in common than in what we don’t. In other words, the bigger picture of Christianity. That is what Warren means. In Brodersen’s Things That Matter segment, he expressed his concern that some in the body of Christ are focusing too much on “non-essential” issues. We are curious as to what those “non-essential” issues are, and we suspect one of those will be criticizing the Catholic Church. The second e-mail we received today was regarding Calvary Chapel’s leading pastor Greg Laurie. The e-mail stated: “As a former attendee at Harvest Christian Fellowship [Laurie’s church], it saddens me that Pastor Greg gives validity to Mel Gibson. 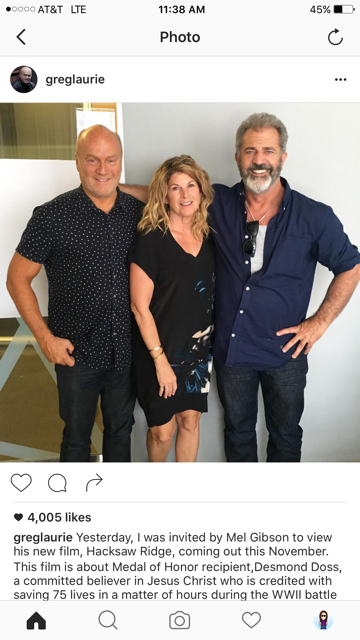 This post was on Pastor Greg’s Instagram.” The Instagram our reader was referring to shows a photo of Greg Laurie, his wife, and Hollywood actor Mel Gibson.